How can you lead a company while changing diapers? That's what some people asked Toms Shoes founder and CEO Blake Mycoskie when he told them he was going to take 12 weeks off when his son was born. Mycoskie said he thought just the opposite: How could he not take the time off? "If a dad doesn't take it or isn't offered it, he's tired. He's distracted. He's probably making bad decisions for the business, and he's feeling guilty he's not at home," Mycoskie told CNN's Poppy Harlow on Sunday. He added that he wanted to set an example for his employees. Toms Shoes offers new parents at least eight weeks paid time off. It adopted the policy several years ago, but Mycoskie said he noticed that some new dads feared that taking time off would hurt their careers. 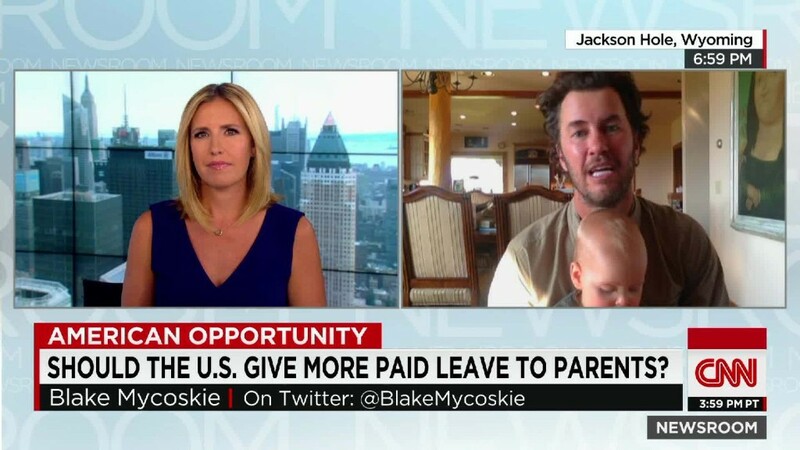 Mycoskie said he believes it's a problem that the U.S. is the only developed country that doesn't guarantee paid time off for new parents. "So much of our strength comes from our families, and if we're not investing in our families, we're not going to be strong in business or in culture," Mycoskie said. For companies, he added, benefits like paternity leave can also help attract talent, particularly millennials. Appealing to the next generation is "crucial" to the future of big businesses, and those workers will be looking for perks like family leave. Federal law guarantees new parents 12 weeks of time off, but does not require employers to offer pay. A number of companies, including Netflix, Adobe and General Electric have bolstered benefits for new parents over the past year. Still, only 12% of private sector workers in the United States are offered paid family leave, according to the U.S. Department of Labor.